Purple cabbage is chock full of vitamin C, which we need so badly this time of year, and cooking it minimally retains as much as possible while still sweetening up the dish. Cabbage is rich in anti-inflammatory compounds, while the anthocyanins (which make it purple) may fight certain cancer cells. More points for cabbage come from fibre, potassium, and vitamins A and K.
Garbanzo beans also contain dietary fibre and protein, potassium and thiamin (B1.) What is interesting about garbanzos is that a serving contains as much iron, if not more, than a serving of lean beef. 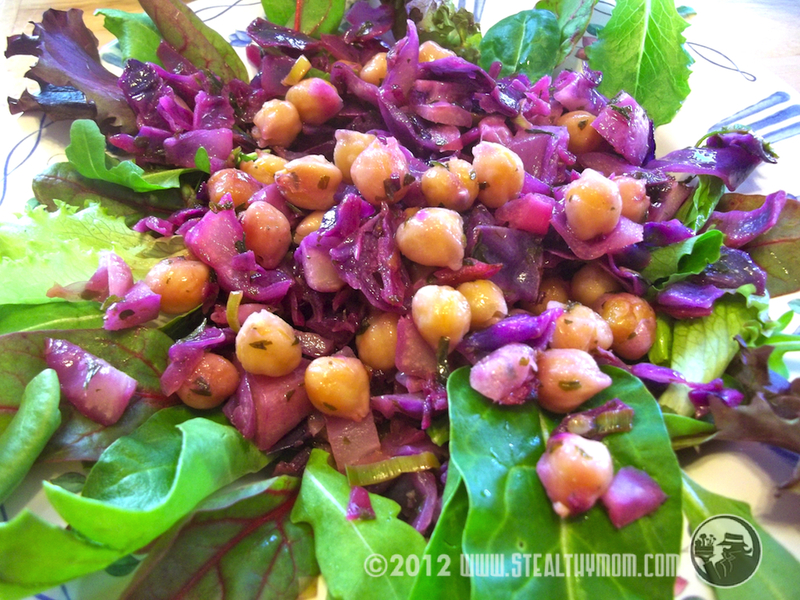 Tossing the the cabbage and garbanzos in olive oil provides another anti-inflammatory agent, and the mesclun mix adds a host of trace minerals and vitamins. Chop the cabbage and toss it with the olive oil and green onion in a pan. Gently heat until the cabbage is softened, then add the beans, lemon juice, salt, coriander and parsley. Toss with tongs or a spatula until the ingredients are hot. Turn off the heat. Place mesclun mix on serving dishes, and top with the cabbage and beans mixture. Serve. I shared this recipe with the Hearth and Soul Hop, Allergy Free Wednesdays, Healthy 2Day Wednesdays, Gluten Free Wednesday, Real Food Wednesday, Full Plate Thursday, Simple Lives Thursday, Gluten Free Friday, Fight Back Friday and Fat Tuesday. This sounds YUMMY! I love all the colors! My name is Cindy and I blog over at Vegetarianmamma.com I wanted to invite you to link up your recipe and any others at our Gluten Free Fridays Recipe Link up party! It happens every Friday and we'd love to have you join us with some of your awesome recipes! It doesn't mean that you have to be a gluten free bloggers. If you have some recipes on your blog that are gluten free that counts! :) Many recipes are naturally gluten free. Thanks for the invite. I just linked up! 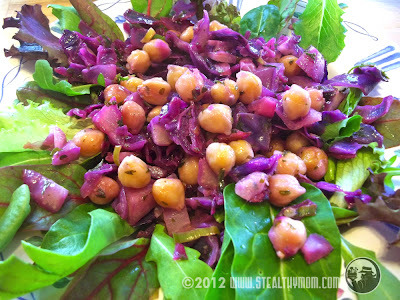 I love the combination of Cabbage and Beans in this Salad, looks good. Hope you are having a great weekend and thank you so much for sharing your awesome recipe with Full Plate Thursday. What a lovely, colourful, flavourful winter salad. It's packed with nutrients as well! Thank you for sharing it with the Hearth and Soul hop.